As I was looking through the May issue of Martha Stewart Living, I found a "Good Thing" for the birdies. Shredded paper, cotton balls, scraps of ribbon and yarn, mixed with dried grasses, dead leaves, twigs and pine needles are inserted into a small tray or crate to be left out under a tree. Imagine the thrill when I see a bright strand of ribbon carefully woven into a bird’s nest. A wonderful way to recycle leftover pieces of ribbon and material for our friends in the sky. I love this nest built by a House Finch. Photo by Sharon Beals. Last weekend, I observed a House Finch in my yard, and she was using pieces of plastic to build her nest. She built her nest in two days. Out my kitchen window, I have a wren house. 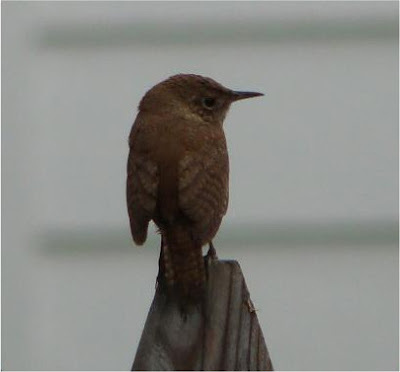 The wrens haven't arrived yet, but here is a photo from last year. They are so adorable. If you'd like to read more about nest material, the Cornell Lab of Ornithology gives yarn scraps a thumbs up. Great idea...last year Howard found a nest that had fallen from a tree by the rec center during a bad storm. It was constructed mostly of that white polyester filling, like in a jacket. It now sits on the armoire in my bedroom. This is a great idea! I'll try this! them for granted. I have to start reading Martha Stewart Living again. By the way she is 71. Can you believe that?! I'd much rather look up and see pretty bits of ribbon than white stuffing.